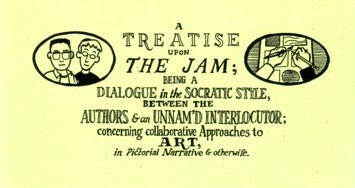 Here you will find information on comics produced by Isaac Cates and Mike Wenthe, with more general comment on comics & collaboration; recommended reading; and sundry matters pertaining to the craft & criticism of comics. 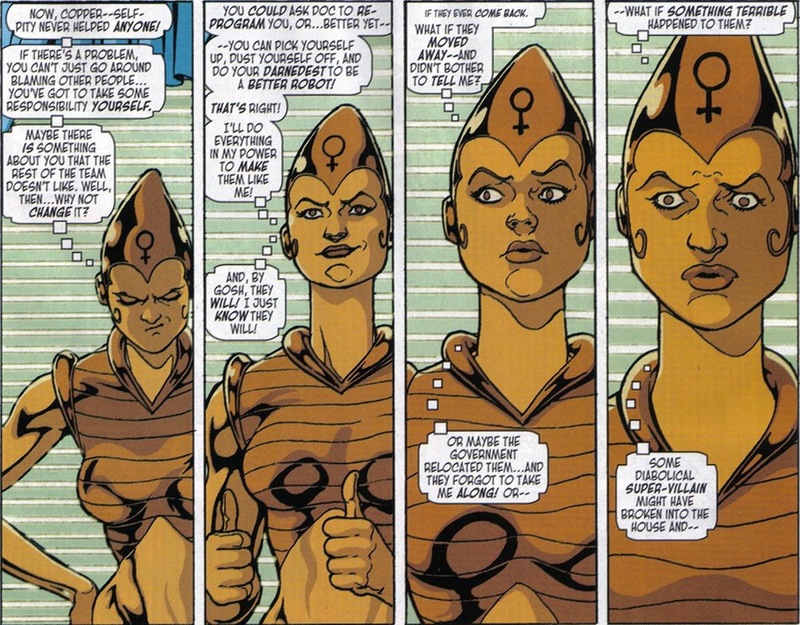 Particular attention will be paid to the two series Satisfactory Comics and Elm City Jams. And now in the course of our AlphaBots we come to Robot Number One in my house. I mean, if you ask my little son who his favorite robot is, he's likely to list Jimmy and R2-D2 (whom he knows from a blinking toy, not having seen Star Wars yet) as well—"favorite" is almost always plural—but his longest-standing robot friendship has to be with Plex. In fact, I'd wager that of all the robots in my alphabet, Plex is the one I have drawn the most frequently. Just this weekend I was challenged to work him into the background of an Aquabats whiteboard mural. I've drawn him in almost ever medium available. 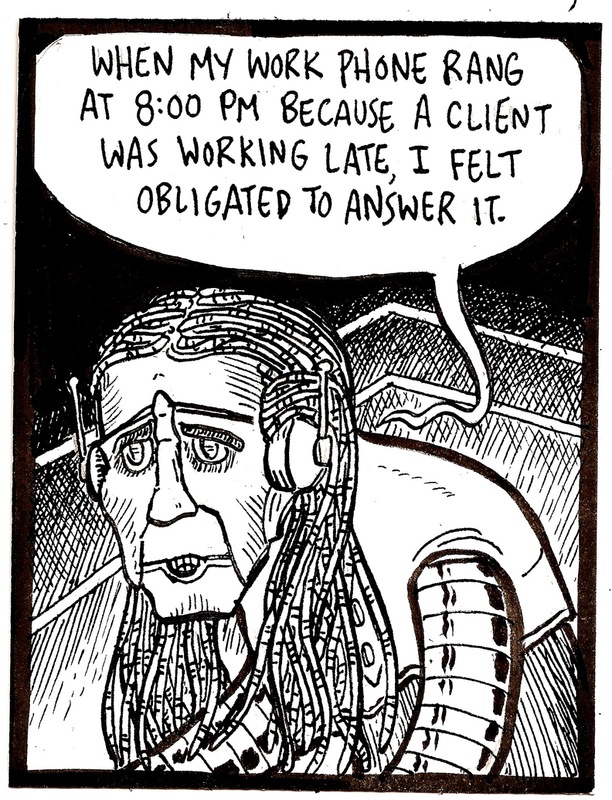 The odd dialogue in my panel above comes from another "dark whisper." Nothing major—just musing about a character I'm creating for a comic you'll hear a lot more about in a couple of weeks. 1. Really stylish design looks simple and is difficult to replicate. I wish I could have done a better job with this. I'm still feeling rusty. 2. I still really enjoy The Incredibles, which I take to be an allegory about middle age and having an uninteresting job that doesn't tap your whole potential. The Omnidroid has almost nothing to do with that reading of the movie, except as its ever-increasing dangerousness becomes a way to push the limits of potential. 3. If I'd been thinking about this a little longer before I started drawing, I might have tried to ape the style of Tom Gauld. But instead this is what you get. The word of the day at dictionary.com is melliferous. 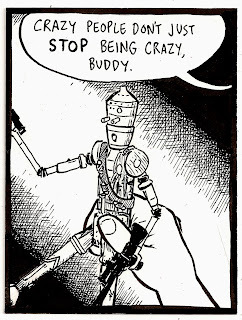 Hey, I'm caught up on AlphaBots! That was fast. I hope you recognize this little hovering menace. He. Is. Nomad., one of the less convincing bits of mid-twenty-third-century alien (well, semi-alien) technology on the old classic Star Trek show that I love so dearly. I'm bending one of my rules to include both Nomad and Data in my alphabet. I want every one of my robots to come from a different source, after all. It's possible that some of the same hands were involved in creating both of them, but in my mind Next Generation is really the creation of a different set of writers and thinkers, with different concerns. Nomad shares a universe with Data in only the most nominal sense. If you object, I could probably come up with another N-bot. But how could I not draw this clunky, inert guy? I'm going to catch up on AlphaBots this week, but I haven't drawn this week's robot yet. Instead, let me give you a member of an inexplicably under-published shape-shifting alchmico-scientific super-robot team, plus an android from a story near to every nerd's heart. 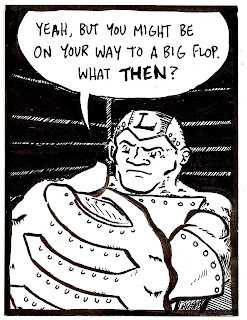 So, first, L is for Lead, the least shiny of the Metal Men. Having thought about this drawing for two weeks didn't make it any better — there's more fun and more energy in some of my preliminary sketches — but it did get me thinking about the special properties of Lead. I wonder: has Lead even concealed something from Superman's x-ray vision? Has he ever formed his finger into a pencil to write a message? Has he ever formed his hands into revolvers and shouted, "Eat lead, copper?" Since he's not the brightest knife in the crayon pack, does Lead have the sort of homophone trouble that haunts modern college students? 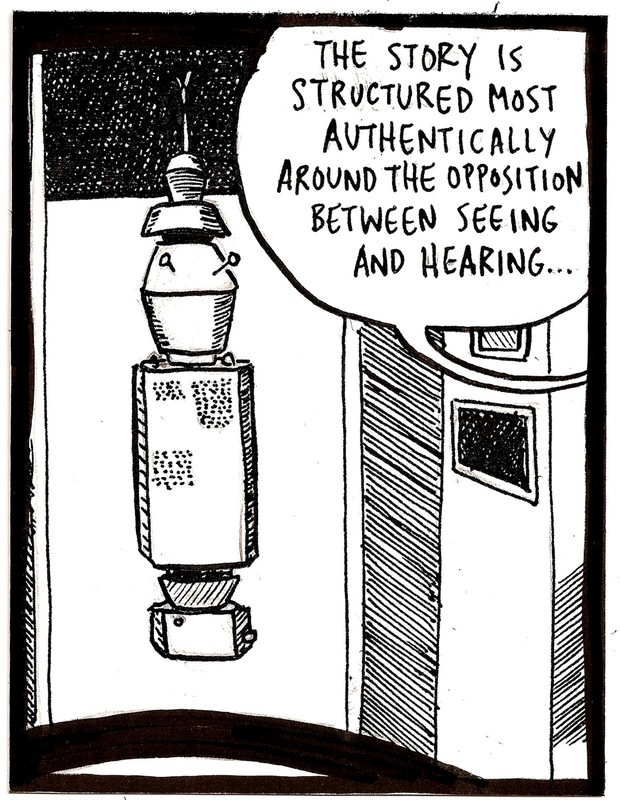 I'm even less happy with this drawing of Marvin, the Paranoid Android. I knew that I didn't want to replicate the movie or TV versions of Marvin, neither of which actually looks very andr-oid. I first encountered Hitchhiker's Guide to the Galaxy as a novel (and then shortly thereafter as a script for a radio show, a radio show itself, and a text-adventure video game), so I had some time to imagine what he looked like before anyone showed him to me. I always sort of mixed Marvin up with Neil from The Young Ones, a show I never really watched (we had no cable and thus no MTV) but heard quoted and described to me an awful lot over the phone. Alas, my skills of robo-caricature aren't up to the challenge. Clearly I'm rusty; the only solution is to draw more. Dialogue in these panels is "dark whisper" and "bibliomantic search" (an alumni magazine that happened to be on the table). 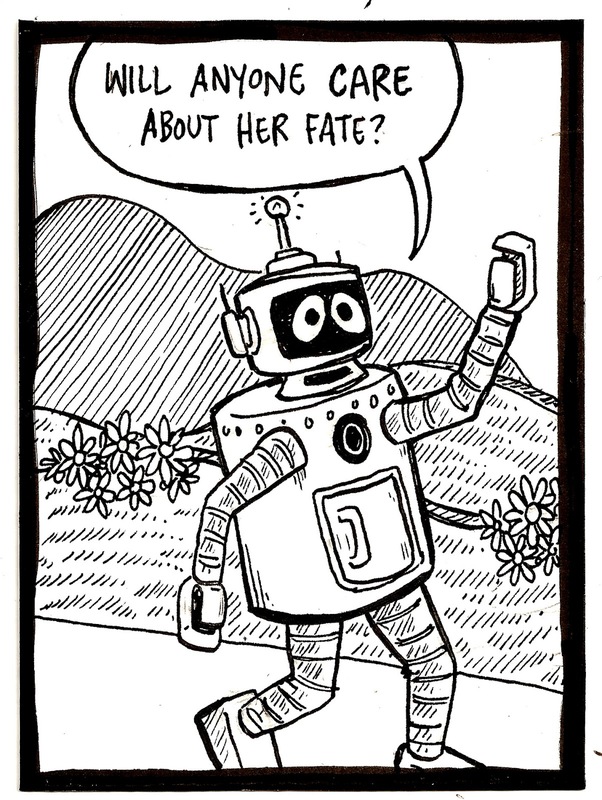 This week's AlphaBots drawing is sure to tug at the nostalgic sentiments of some. And he is a faithful, charming, and useful robot by anyone's estimate. As I have mentioned before, I was never a huge devotee of Doctor Who myself, though I did watch it when I could for a little while when I was in junior high. I even read one paperback novelization of a story arc on a trip to my grandmother's house. The local PBS station was broadcasting episodes with the Tom Baker incarnation of the Doctor, and I had a hand-me-down TV in my bedroom that barely picked the station up. I consequently think of Doctor Who as a secret, almost underground show, half-masked in the snow of bad reception. I know that's not the way most people received it. On reflection, though, I realize that those weird, low-budget shows were one of the first cultural products that I found entirely on my own. I don't know whether I even talked to people about it. If someone told me I'd dreamed or hallucinated the whole business, I'd almost believe it. 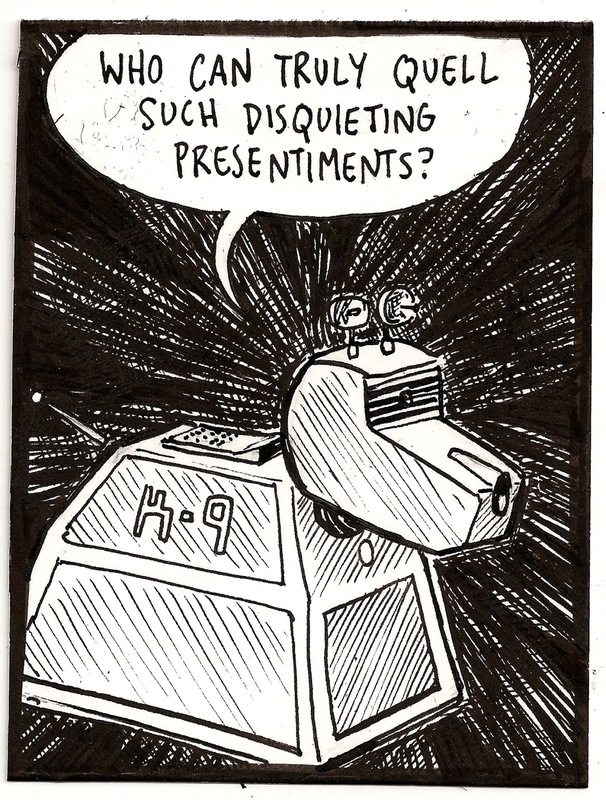 So, anyway, I remember K-9 with a sort of cobwebbed fondness, but he's not a major part of my contemporary situation like some robots. I'm not wild about my drawing for this week's Alphabots, but I know I don't really have time to try again. And it's a shame, because I really had wanted to do a nice tribute this time around. I think I've seen every episode a dozen or more times—enough that I can tell you when to look for the secret guy in a fox suit in most of the episodes. 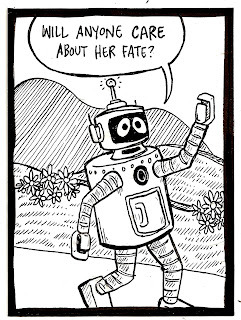 So this week's Alphabots choice was sort of a no-brainer. 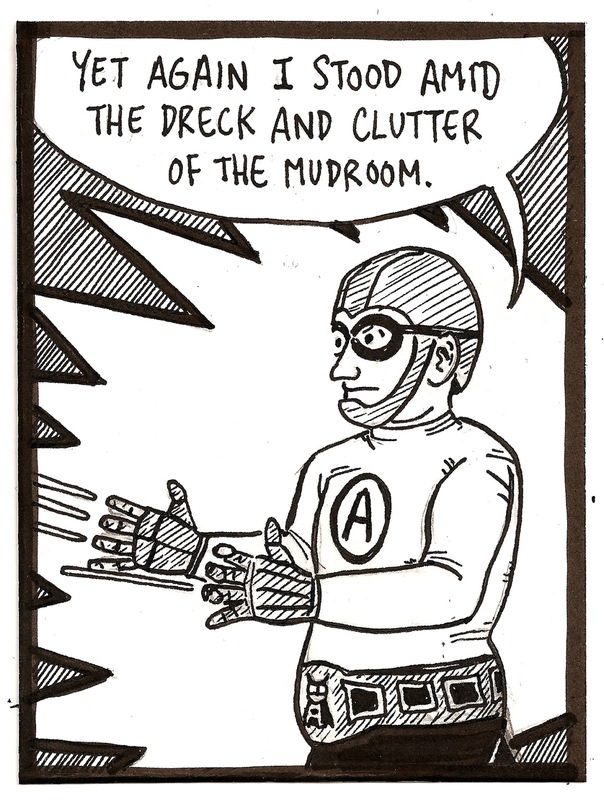 The text in this panel comes from Paul Muldoon's poem "The Mudroom," which I'm teaching on Tuesday. (I rolled "phrase from your reading.") It's a lot weirder than this sentence makes it seem, I tell you what. 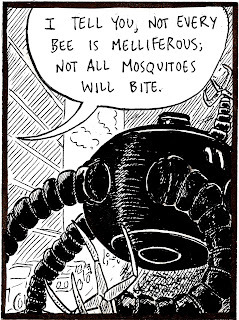 I think this week's AlphaBots selection will turn out to be pretty popular. There aren't a lot of robots that start with I, and this one is pretty fun to draw. As far as I knew before I started work on this, IG-88 was just one of a lineup of bounty hunters, like Zuckuss or Bossk, who looked cool but never got a line in Empire Strikes Back: set dressing in the movies; awesome extras in my action-figure collection. Actually, I never had the Zuckuss figure, and the IG-88 figure was especially lame — I've drawn him with much more bendable arms than the ones I remember. But what a strange sight he was, with that pope-chapeau head and those pipey limbs. Give that video a couple of minutes. It starts slowly, but around 2:00 it starts to get pretty fun. As for the dialogue this week, well, I rolled "dark whisper," and that's all I need to say. BIG "SUMMER" SALE STILL ON! Click here for a big sale on our back issues, in a variety of value packs—or create your own set! If this is your first time here, please check out some of our earlier comics: Satisfactory Comics #6, Satisfactory Comics #7, Elm City Jams #2 (all for sale), and Tales from the Classroom. These will give you a taste of what our readers seem to have liked best. Look behind the scenes of our latest issue, Satisfactory Comics #8, by reading these posts from bottom to top, or get a quicker look at our constraints and results here. Thanks for visiting! Please leave comments to tell us what you think.